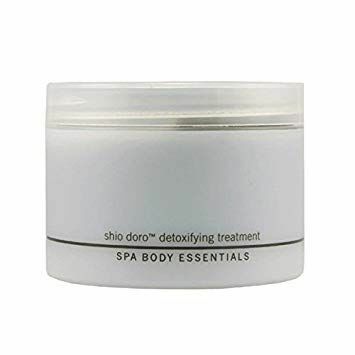 Home/Credentials/Credentials Shio Doro Detoxifying Treatment 8fl oz. Credentials Shio Doro Detoxifying Treatment is a fusion of unique ingredients from across the globe. Natural sea salt with its high mineral content direct from Okinawa combines with organic colloidal fresh water silts from the Baltic Lakes to improve skin smoothness, texture, and tone. The intricate mix of trace mineral elements along with Arctic peat, wasabi, and Japanese mushroom extracts assist in removing debris and impurities while Arctic cloudberry seed oil with its essential fatty acids deeply hydrates the skin. Highly detoxifying to enhance micro-circulation and release toxins out of the skin tissue. Apply a generous amount all over the lower body, massage in circular motion paying special attention to areas suffering from cellulite and loss of elasticity. Rinse thoroughly with warm water, then towel dry. Follow with Cellufirm Contouring Serum. Sodium Chloride, Glycerin, PEG-8, Silt, Pumice, Silica, Polyglyceryl-10 Dipalmitate, Rosmarinus Officinalis (Rosemary) Leaf Oil, Rubus Chamaemorus Seed Oil, Algae Powder, Spirunlina Platensis Powder, Algae Extract, Citrus Medica Limonum (Lemon) Extract, Lactobacillus/Wasabia Japonica (Wasabi) Root Ferment Extract, Lactobacillus/Ganoderma Lucidum (Reishi Mushroom) Extract/Lentinus Edodes (Shitake Mushroom) Extract Ferment Filtrate, Olea Europaea (Olive) Leaf Extract, Peat Extract, Spirulina Subsalsa Extract, Sea Salt, Menthol, Water (Aqua), Propylene Glycol, Diazolidinyl Urea, Methylparaben, Propylparaben.